Concerned about your inflammation levels? Take our Inflammation Quiz at the link below. Learn what factors are attributed to high inflammation, and what you can do about it. About: We developed the Inflammation Quiz to help you assess your lifestyle behaviors and learn more about how to implement an anti-inflammatory diet for pain relief, weight loss, and overall health. 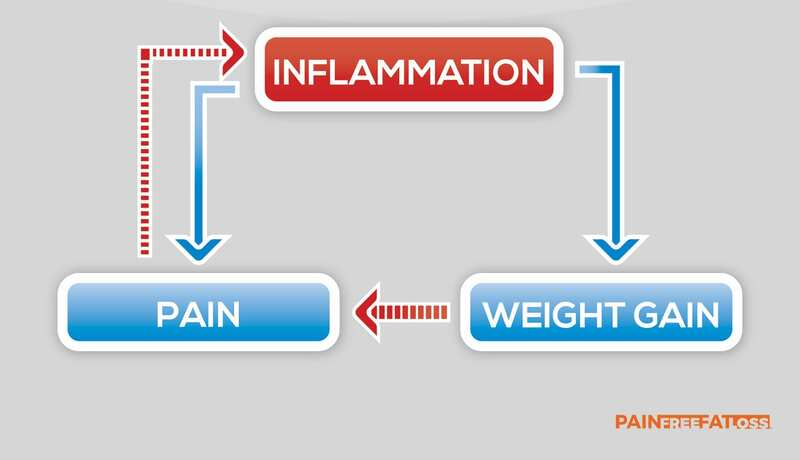 Q: How does inflammation cause pain and weight gain? And worse yet, weight gain results in the release of more pain-causing hormones, and even more inflammation. ​It’s a self-perpetuating system that’s nearly impossible to escape from. But we have a way to address this cycle. Head on. The mechanism isn't completely clear. But we know from animal studies that pro-inflammatory cytokines cause insulin resistance. Pro-inflammatory cytokines are cells released by your body's immune system in response to inflammation. Insulin is a type of storage hormone your body produces in response to high levels of blood sugar. Why is insulin resistance a bad thing? Because it prevents your body from using nutrients properly. And not only does insulin resistance lead to increased fat storage, it can cause to Type 2 Diabetes. Fat cells are often the first cells affected by inflammation. The inflammatory process actually begins in fat cells. This causes oxidative stress (also known as "free radical damage"). Which leads to much bigger problems down the road. Diabetes, neurological diseases, heart disease and arthritis are all exacerbated (if not CAUSED) by oxidative stress. Inflammation produces cells and free-radicals that circulate through your entire body. So it doesn't just impact your fat cells and joints. The worst effects are in your brain. Leptin is your master appetite hormone. It tells your body when it's full, and when it needs more food. When you become leptin resistant, your body doesn't know when it's full. Your natural appetite shut-off valve is broken. In my estimation, this is the most UNDERSTATED negative consequence of inflammation as it relates to weight gain. Inflammation breaks down joint tissue. This leads to joint pain, and often to full blown osteoarthritis. So not only does inflammation lead to arthritis. Which makes arthritis develop more quickly. Take our inflammation quiz at the link above, and learn exactly what YOU can do to correct course.